Today was a crazy productive day. I ended up working a full day yesterday because my boss’ son was in a severe motocross accident over the weekend. He will make a full recovery, but has a long road ahead of him. Please say a prayer for Coleman. Usually Mondays are either a prep day or errands, but with my long work day I didn’t do either. I was able to get in my first workout of The New Rules of Lifting for Women Stage 7. Dang! I forgot how challenging these circuit-style workouts are. It definitely worked my muscles and lungs to the max. I am so sore today and very excited for workout 2 tomorrow! I have a date with Allan to watch the Lord of the Rings Two Towers along with sorting clipped recipes into binders, so this post is going to be short. However, before I go, I want to share the recipe that I previewed yesterday. This POMinty Watermelon Sorbet is closer in texture to a snow cone than sorbet, sherbet or ice cream, but it is oh.so.good. Matthew loved it so much! He ate the bowl that I made for him and then tried to steal some of Allan’s. The best part is that you don’t need an ice cream maker to enjoy it. While enjoying a bowl yesterday, I thought that these would work well as popsicles… Even better yet, adult popsicles (+vodka). If you do make popsicles, please come back and let me know how they turn out. Cut watermelon in half, scoop out flesh and cut into 1-inch chunks (4-5 cups), place in a sealable bag and freeze until solid, about 1 to 2 hours. This step can be done a couple days ahead of time. Place frozen watermelon chunks, pomegranate juice and lemon juice into a food processor or blender and purée until smooth. Add milk, honey and sea salt. Continue to blend until combined. Stir in mint. If using an ice cream maker, freeze mixture according to manufacturer’s instructions (usually about 20-30 minutes). If not using an ice cream maker, using a spatula, scoop mixture into a shallow 13 x 9-inch freezer-safe container. Loosely cover with plastic wrap and place container in freezer for about 2 hours, or until frozen around edges and almost frozen in center. Break frozen pieces into chunks and place entire mixture into food processor or blender. Blend until smooth and creamy, about 2 to 3 minutes. Alternately, you can use a wire whisk to smooth out mixture instead of a food processor or blender. Place mixture back into freezer-safe container and into freezer to set for 2 to 3 hours or until mixture is scoop-able. If your sorbet becomes very hard and “snowy” in texture, use the following method to soften it. 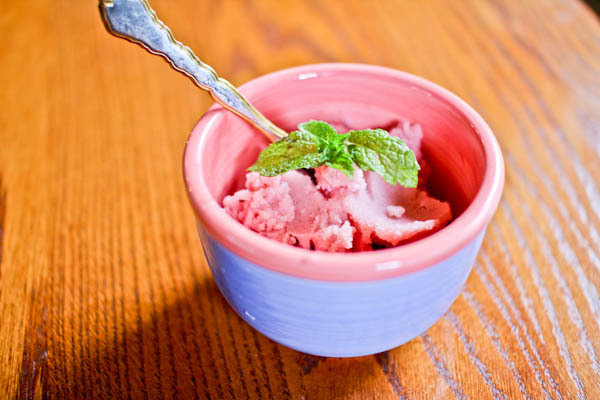 Allow container of sorbet to warm slightly in fridge for about 5 to 8 minutes or until soft enough to break apart or scoop. Break desired amount of sorbet into pieces and place into food processor or blender. Purée mixture until creamy. Sorbet may be served immediately if scoop-able. If mixture is very soft and not able to be scooped into a ball, refreeze for about 1 hour. To serve, scoop into serving bowls, garnish with mint, and serve immediately. Best when devoured enjoyed within 2 to 3 days. Store covered in a sealable glass container in freezer. What is your favorite melon? I love sweet, simply cantaloupe.